Many of us have witnessed first-hand (and we have all seen TV) the destruction that results from especially violent hurricanes, tornadoes, storms, floods, or earthquakes. These events even seem to be more common in recent years. 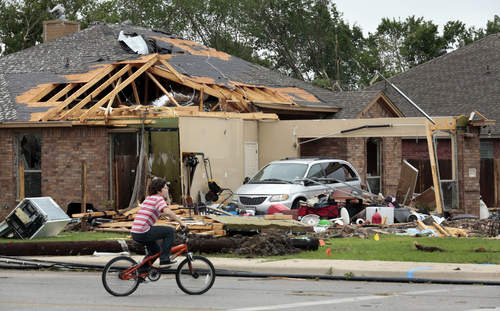 Although these tragedies often cause loss of life and major damage, one positive result is that we are learning what it is about homes and other buildings that make them more likely to be damaged. Studies show that strong natural forces "pick on" weaker homes-that is, buildings with some kind of structural defects are most likely to be damaged. Time and again we see that well-built and properly maintained homes are the ones that make it through major calamities with little or no damage. A structural defect can be the result of a design or construction flaw. But weakening is also caused by termites, carpenter ants, and wood decay fungi-anything that attacks structural wood. Left unchecked, these pest can reduce the strength of wood by as much as 80%, leaving a home weakend and more easily damaged by strong force of nature throws at it. Porch columns can have a good-looking masonry exterior base that concealed termite-damaged wood. The poorly-constructed column can break open during a severe storm, bringing down the roof that it supports. The moral of the story? Be vigilant in keeping your home in good repair and free of woo-damaging pests. This will pay for itself many times over in fewer and less expensive repairs both now and as each year passes. While fortunately some pest are less active in late fall and winter, others remain active, or may become even more of a problem. Here are a few of the pest problems we are controlling this time of the year. Problem with rats, mice, ants, silverfish, and cockroaches continue. Pest that eat stored food, such as flour moths, beetles, and weevils, also continue to target food in kitchens, garages, and anywhere else human or pet food is stored. Pests that moved during late summer and fall often "wake up" from their semi-hibernation and become active on warm days now until early spring. Once reactivated, they spill out into living areas and start crawling or flying about. As people take wool clothing out of storage, they may notice holes caused by clothes moths and carpet beetles. These pests also damage leather, fur, and any other items of animal origin. People are bringing in more firewood these days, and they may be bringing in "hitchhiking" pests that are hiding in the crevices and cracks of the wood. These include spiders, ants, crickets, mice, and many other pest. Christmas trees also may have pests on them, and these become active when brought into a warm room. Rinsing the tree with a strong spray of water before it is brought inside will dislodge many of these pests. Wild animals are also looking for places to stay warmer and drier. Mice, rats, raccoons, squirrels, skunks, and other animals are seeking shelter this time of the year. Both chewing termites and rodents have caused leaks in flexible PVC tubing (also called Spa Hose), the kind used in pools and spas. But now a different kind of insect-caused damage is also showing up in PEX tubing, a flexible plastic tubing used in plumbing and radiant heating. The leaking in this tubing is not because it has been chewed on, but from microscopic holes. It was recently discovered that these holes can be caused by certain overwintering insects that randomly puncture the plastic with their sharp, needle-like mouthparts. Some insects have surprisingly strong piercing mouthparts-some of them puncture hard seed shells to feed on the nutritious seed inside-which is why they are able to puncture plastic tubing. Common pests that have these types of mouthparts include boxelder bugs, stink bugs, and western conifer seed bugs, a fall-invading insect that has been spreading to new areas around the country. Automakers have switched to a new biodegradable wiring insulation in recent years. It's great for the environment, because it doesn't last forever in landfills, but it is a soy-based and appears more likely to be chewed up by mice, rats, and squirrels. Sometimes these pests even use bits of the wiring insulation to build their nests somewhere on or around the engine. Replacing pest-damaged wiring can be very expensive, usually costing hundreds of dollars. The rodents may just chew the insulation, or they may chew all the way through the wire. In either case, the wiring is damaged and will need to be replaced. If you see evidence on rodent activity in your garage, or around your home, contact us to control them before they cause damage. Gnawing rodents also can damage wiring in homes and other buildings. According to the National Fire Protection Association, fire departments respond to 46,500 home structure fires that involved electrical failure or malfunction in 2010. These fires have many causes, of which rodent damage to wiring is one major factor. Rodents are not to be ignored. Research shows that most of the worst ant pests are not natives-they were accidentally introduced into this country. Non-native ants eventually can become very serious pest problems because they have competitive advantages (such as having queens in each colony, allowing the colony to grow and spread faster) and because many arrive here without their natural enemies. An alarming new study has calculated that there are three times more non-native ant species in our country that what has already been discovered. Many new ant species may not have been discovered because they haven't spread far yet, or because they look very similar to know species. This means that although ants are already the pest that people most often encounter, in the coming years even more different kinds of ants will be invading homes and businesses. Effective ant control will require even more training and experience and become even more complex-a challenge we are up to! Research shows that besides becoming new indoor pests, new invading ant species also disrupt our natural ecosystems, decreasing populations of our native animals and plants. Since pest management professionals, like Greenleaf, are often the first ones who spot new pest species, we have an important role in protecting our ecosystems. This is in addition to working to protect the health and property of our valued customers.